Maya Moore and Candace Parker are set to battle once again tonight in Game 4 of the WNBA Finals. Photo by Mark J. Terrill/Associated Press. The Los Angeles Sparks and Minnesota Lynx will battle Sunday in Game 4 of the WNBA Finals in what could be a deciding game for the host Sparks, who hold a 2-1 series lead. Last year the two teams faced the same situation, as Los Angeles won the first and third games of the series and the Lynx took the second. The Sparks then lost Game 4 at home and won the title in Minnesota. Los Angeles had a full practice Saturday, while the Lynx had a shoot-around. Off court, members of both teams talked about the series and what it will take for their squad to win the fourth game. The tenth-year forward said playing a team they’ve faced so many times is a challenge. Continuing to play defense at a high level of intensity will be key for the Sparks, according to Parker. Parker said she is careful not to let her mind interfere with her play. Being in the right frame of mind is critical to success. 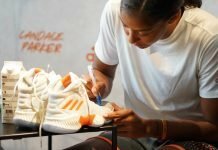 Part of Parker’s growth over her time in the WNBA has been about being more calm, as she was in leading the Sparks to a Game 1 victory. 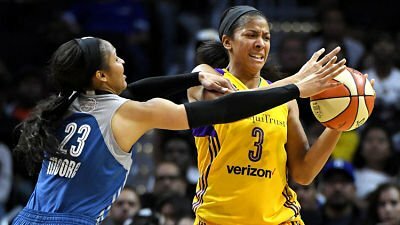 The WNBA defensive player of the year said that though Los Angeles dominated their opponents in Game 3, they shouldn’t get comfortable. Beard said the team will have to take care of the basics to win. Beard said the Sparks’ destiny is in their own hands. The 2016 league MVP said Los Angeles has peaked at the right time. In a way, Game 4 of the series will be just another matchup for Ogwumike. But that’s not to say Ogwumike isn’t girding for a battle. Lavender echoed the two-year-old Los Angeles philosophy of taking one game at a time, and admitted that not taking that approach cost them Game 4 in last year’s Finals. Lavender said the Sparks are prepared to fight in Game 4. The uniqueness of the Sparks, according to Lavender, is in the bonds they have formed off the court. The fourth-year guard is in her first season with Los Angeles after being acquired in the offseason, and she has moved into a starting role with her fearless, electric play. She said the year has been tremendous for her, both professionally and personally. Sims said the Sparks have become like an extended family to her. Augustus said the Lynx are not affected by expectations that they avenge last year’s Finals loss. Augustus said she her teammates don’t worry about the fretting of their fans when they don’t play well. This year’s regular-season most valuable player said the rest of the Finals series will be a battle of the minds. Fowles said setting the tone in Game 4 is key. 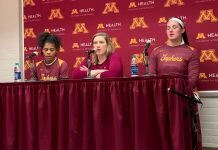 Minnesota’s beloved point guard said the outcome of Sunday’s game will depend upon who wants the win more. Whether it is a physical or mental game at this point is a tough call for Whalen. When asked if she’d seen two teams match up as well as the Spark and Lynx before, Whalen was, as she is usually, a woman of few words. The former MVP has struggled at times in this series, but has battled back each time. She said the key to a Minnesota Game 4 win is concentration. Moore said external pressures to achieve are largely insignificant to her. Seven years as a professional athlete has taught Moore to be especially tough, she said. Montgomery came up big for the Lynx in Game 3, scoring 12 points off the bench when starters weren’t able to produce. She is ready to produce again in Sunday’s game. The Lynx will be ready, according to Montgomery. “There’s nothing we haven’t been prepared for in practice. 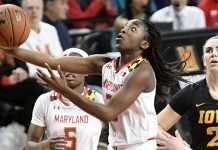 It’s everything we thought it would be: it’s a knockdown, drag out, each possession is the biggest possession,” she said.